Organizers say ‘charged’ agenda makes the marina conference more dynamic and more relevant. Organizers of the International Marina & Boatyard Conference in January say they have arranged for a more robust program this year. 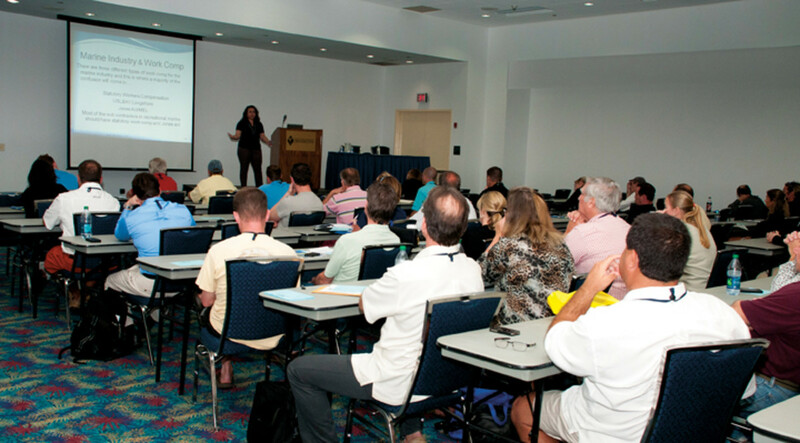 The International Marina & Boatyard Conference is changing. Organizers decided the show needed “a new charge,” so they are ramping up their investment in speakers and content in their effort to breathe new life into the event, which takes place Jan. 29-31 at the Broward County Convention Center in Fort Lauderdale. IMBC’s keynote address will focus on how you can get things right by first getting them wrong. Motivational speaker, bestselling author, and former comedian Steve Donahue will discuss how to develop a stronger business sense by learning from mistakes and motivate participants to find the heart of their company’s story in order to communicate better with their customers and offer superior service and sales. A graphic recorder will create a visual display from the presentation to encourage further discussion and networking. Donahue will follow up his keynote presentation with an interactive roundtable in which participants will break into groups to work on their company stories and hone their company messages. The show also has beefed up its focus on engineering, adding a full-day marina design course on Wednesday, Jan. 29. The course will be presented by the American Society of Civil Engineers, which will offer case studies to demonstrate the application of highly integrated planning and design approaches to small craft harbor development. IMBC planners also are including a full engineering track — one of four tracks at the show — that will focus on the design, construction and maintenance of marinas, according to Jim Frye, the IMBC’s master of ceremonies and vice president of Westrec Marinas. Schellbach says the presentation will be interactive, letting the audience tell the presenters what they want to learn more about. The conference will offer several ways of presenting information, he said. Informational sessions will have a speaker in a one-way delivery format. Panel presentations also will feature speakers and will include a chance for questions and answers. A “learning story” format will split the time 50/50 between a presenter with a case study and the audience, allowing for more peer-to-peer learning. The “discussion” format will take that a step further, with presenters acting more as facilitators, “leading the entire group in a discussion of a particular topic or issue,” Frye says. Interactive sessions will be best suited to product demonstrations and hands-on experiences, he says. “Deep-dive” sessions will allow participants to explore an area of interest, learning new skills or developing new strategies through brainstorming or theorizing. Lastly, “step-by-step” workshops will provide the tools and building blocks for learning new processes, techniques and practices. Last year more than 700 people, representing 12 nations, attended IMBC, says Rachel LaMarre, director of events for the Association of Marina Industries. The conference also featured 130 booths staffed by representatives from 110 companies. To get a better sense of its audience, AMI asked conferees to qualify their roles at the marinas. In 2013, 51 percent were the final decision-makers at their marinas, 22 percent had some buying authority, 21 percent made recommendations and 6 percent played a small role. Another session will focus on wind speeds and marina pile anchorage. The increase in storms means more marina owners and managers are faced with determining the wind-load capacity of facilities, how vessel occupancy affects their anchor loads and when boats should pull out. Fluctuation in temperatures and increasing numbers of storms, combined with the lingering challenges of a sluggish economy, make smart designing and engineering a hotter topic than ever, so it will be the focus of another session. The pre-conference American Society of Civil Engineers marina design course is based on the recently published ASCE Manual 50, Devlin says. It will be presented by the primary authors of the manual and will use case studies to demonstrate how to apply highly integrated planning and design to small-craft harbor development, including breakwaters, inner harbor structures and land-based support facilities. The old adage that the only true constant is change has never been truer, Frye says. “Today’s world is full of challenge. Those who seek constant improvement for themselves and their businesses are the ones who will persevere and thrive. The marina industry hasn’t always been a paradigm buster, but we’ll need new ideas, techniques and technologies to compete for discretionary spending. The information sharing that is the hallmark of IMBC will help participants to compete today and tomorrow. Providing evolving content to match the times is crucial to maintaining the industry’s health, Groenewold says. This article originally appeared in the January 2014 issue.